Tile roofs are very common. This type of roofing has a long lifespan and is very aesthetically appealing. Most tile roofing can typically withstand various weather conditions, but occasionally too much rain can cause problems. Tiled roofs do shed rain, but an abundance of consistent rain can cause water to get under the tiles. When windy conditions allow for water to seep underneath the tiles, over time the moisture can wreak havoc on the underlayment, which results in water seeping to the roof deck, and create both dry rot and interior damage. A tiled roof will last for at least 50 years, possibly longer, and by being prepared during the rainy months of April and May, you can prevent water damage. What you need is a tile sealer, so that the tiles remain tight. Clay, stone, and concrete tiles need a sealant to protect the top layer from water seepage. A tile sealer usually comes in a spray application. The tiles need to be scrubbed prior to sealant application, unless the roof is new. Time for the tiles to dry is also needed. A tile sealer application works best when the sealing solution is sprayed from the peak (if there is one) on downward. There might need to be multiple applications of tile seal applied before the roof is completely protected from water damage. 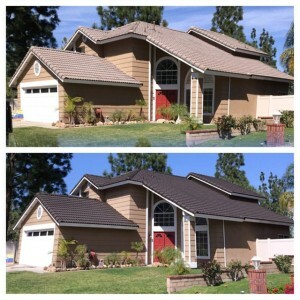 At Custom Coating Restorations, we provide a variety of tile roof services, including both tile cleaning and tile sealing. To learn about our services and to get ahead with protecting your roof for spring showers, contact us today.